In our offices, we have a kitchen table which, as in many work and home spaces around the world, is where some of our most compelling conversations take place, prompted by informality and collegiality. I will be trying to capture the spirit of these conversations in a new interview series with my colleagues. The first interview took place on October 24th, with our newest staff member, Sam Perlo-Freeman, who is taking the helm of the WPF’s program on the global arms business and corruption. 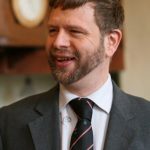 Sam comes to WPF after nine years of working with SIPRI on the military expenditure database, and is one of the world’s leading experts on global arms sales. Bridget Conley: How did you become interested in doing research on the international arms business? Sam Perlo-Freeman: I have peace campaigning pretty much in my blood. I was bought up in a very political family. I was on CND demonstrations in my preteens in the 1980s and founded a local CND group when I was thirteen. SFP: Campaign for nuclear disarmament in Britain. I was involved in that from a very early age. Then later in university, during my post graduate studies, I started moving on after the Cold War, when the nuclear issue had lost some of its immediate salience. I started becoming interested in the international arms trade. This was prompted by seeing John Pilger’s film, “Death of a nation,” about East Timor and the Indonesian genocide. This violence was completely enabled and supported by arms sales from the US primarily, but also the UK, to Indonesia. At the time that got me interested in the arms trade issues related to conventional weapons and I became involved in Campaign Against the Arms Trade in the UK. From there it was a fairly natural step to start looking at a more academic angle, a research angle. It played to my strengths and I ended up doing another PhD in defense and peace economics, looking at military spending and arms transfer to developing countries. That is how I got involved in researching the issue, while always trying to keep one foot in the campaign side as well. BC: How many years did you spend at SIPRI? BC: Nine years. And there, you were working on the military expenditure database. Could you introduce that project to our audience? What is that database and what was the work that you did on it? SPF: I started out for the first year and a half on the arms industry database and a bit on the military expenditure database before moving on to run the military expenditure database. That is a database of military expenditure that until recently has gone back to 1988, with annual figures for about 170 countries where data is available. Over the course of the year, we collect source material — budget documents, expenditure documents, media reports, international organizations that report on military expenditure for all these countries, and they key research is to review all of these sources and try to form consistent series on military expenditure so that we can properly evaluate trends in each country over time. The tricky thing is that there are so many different ways that military expenditure is reported that are not consistent across countries and very often not consistent over time. Countries change the way they report, or indeed if they report at all. The key work is in getting as far as is possible consistent and comparable series, which we then publish each year and make available to researchers, civil society, policy people, media and anyone who is interested. It always did get a very large amount of media interest every year when we reported it, and is very widely used by academics, students, civil society and so forth. BC: How did you deal with the challenges that, at least in some cases, the deals are actually quite shadowy. There is quite an effort to cover up where the money is coming from, who it is going to, what the arms are–what detective work did that job entail? SPF: That is one of SIPRI’s other databases: the arms transfers databases, which I did also work on in the last year or so when we merged all three data projects: military expenditure, arms transfers and arms industries. The third one looks at the companies and their arms revenues. In the military expenditure database we are not concerned with that. We very much wanted to be able to produce disaggregated data, personnel, equipment, operations, infrastructure, research and development, and so forth, but we haven’t had the time and resources to do that. So what we’re producing is total figures. Ultimately, that is dependent on national reporting. We know that very often there is hidden military expenditure, off-budget military expenditure. Where we could, we tried to look for items of spending in other budget lines, sometimes we could find that information, but most of the time, if its not reported, then it’s not reported. You can’t get it. You can sometimes footnote, “this excludes off budget expenditure on such and such,” but it’s rare that you could get details. When you’re looking at arms transfers, it is actually surprisingly not as hard as you might think to get information on international arms sales. For the most part, companies, for the larger equipment, certainly, companies are quite happy to boast about the sales that they’ve been making. Governments also, are happy to show that their country is succeeding in making these arms sales. And if we’re talking really big things like planes, boats, ships, and tanks, it’s kind of hard to hide them. For the arms transfer database, we search through dozens of different sources: mainstream media, specialist defense media, blogs, national reports on exports or imports, reports of the United Nations, arms nerds, sites where arms nerds post photos of military equipment or reports of military parades, or something like that, showing off the latest equipment that the country has acquired. I am sure that we miss some things, but I think for what SIPRI is trying to do with that database, focused on major conventional weapons, we catch the great majority of what is going on. What is much harder to trace is small arms and light weapons. Small Arms Survey, another organization, do work on that, but they do not attempt to give a comprehensive picture of the trade in small weapons, because that is easy to hide. It is very often not reported on. It happens in all sorts of back channel deals, arms are smuggled across borders, and so forth, often very porous borders, so there is very little reporting. Keeping track of the trade in small arms is essentially impossible. You can do case studies of particular areas, particular conflicts, to get some sort of a picture, but getting an overall comprehensive picture — that’s not possible. BC: And what do you think is the value of these datasets? It’s an enormous undertaking to update them every year. What do they enable us to see? What do they empower for people who use that data? SPF: They allow us to see overall trends and ballpark figures of how much is being spent on the military worldwide, and how the arms trade worldwide is growing or shrinking. Who are the big players? Which countries are increasing their spending or their acquisitions which countries are cutting it. I think it’s very helpful in helping provide a picture of what’s going in this area in the military sphere worldwide. It’s a very valuable instrument of transparency, allowing citizens and civil society to see where their money is going, what their government is doing, and comparing it with other countries in as far as is possible in a reasonably consistent and comparable way. I think in that respect as an instrument of transparency and shining some source of light on the scale and nature of international military spending, arms acquisition and trade, it’s very useful. It certainly is very widely used by researchers, students, civil society, political decision-makers, communities, and diplomats make very extensive use of this. The media report on it extensively, so it seems to be something very much in demand. We also saw it as a global public good. BC: There is a lot of social science research documenting that wars are increasing after some time of decrease, and particularly internationalized wars that tend to use heavy equipment and to last longer. Do you see a comparable rise in the scale in military expenditures? Or are these two things not necessarily linked? SPF: Military expenditure increased very rapidly after 9/11. That was led by the United States, very much followed by a bunch of other countries. But this was before the big general increase in conflict. Of course, the U.S. was in Iraq and Afghanistan, both of which played a part in the US increased spending. But in other parts of the world, it was driven by strong economic growth, in particular by very high oil revenues, which tend to be channeled to military spending often in very corrupt ways. One can also see international rivalries – US/China, for example — at the root of this, but not necessarily conflicts. In conjunction with this, the international arms trade has been growing steadily according to SIPRI figures even after world military spending (which includes personnel, operations and maintenance, procurement, R&D, and construction/infrastructure, etc.) stopped rising after the global economic crisis. Since then you’ve seen falls in the west pretty much offset by increases in other parts of the world. In conjunction with this, the international arms trade has been growing steadily since the early 2000s, and that’s continued even after military spending stopped rising, as its driven more by demand in the developing world which has continued to grow. Again, this increase in the arms trade predates the increase in conflict, which has really been since 2011. And again, oil seemed to be one of the big factors in it. Huge oil revenues when the price was high. New countries were discovering new sources. A lot of the big buyers — Saudi Arabia, the Gulf States, Venezuela, Algeria have been countries with a lot of oil revenues. BC: Has there been any impact of the Arms Trade Treaty on expenditures? SPF: On expenditures or transfers? No. It would be hard to track it, in any case, since it was only signed in 2013 and only just recently came into effect. The Arms Trade Treaty is about getting countries to establish a system of regulation, if they haven’t got it. That is one definite positive about it, if implemented. There are various efforts at capacity building in developing countries to help them implement it and implement proper systems of regulation if they don’t have them already. How much effect that will have, we don’t know. But that is mainly to stop the illegal, illicit trade in arms, mostly small arms and light weapons. There are also criteria that countries are supposed to follow in deciding whether to export arms—such as whether they might be used in violation of international humanitarian law, to stop wars and so on – but in general, though, they’re weaker criteria than what already exist in most European countries, for example, and criteria which are routinely ignored or interpreted in ways that are very favorable to the arms industries, and which basically are designed to have enough leeway for interpretation as to never stop a major arms deal if a country wants to make it for political industrial reasons. The Arms Trade Treaty is not going to change that, apart from the fact that lots of countries haven’t signed it, or haven’t ratified it. When it comes to major deals, the Arms Trade Treaty isn’t going to stop one major transfer that would have taken place without it. What it may do is to have some countries put in place more systematic systems of regulation than they had before. It might help in combating the illicit trade. So there might be some marginal gains for it. It’s possible in the long run that it might be one step towards establishing a sort of international norm against transfers that are used to bomb civilians and so forth, but that is a very long term effect. And as we see in Syria and Yemen, it’s not apparent so far. BC: And a final question, what is the program that you are leading here now at World Peace Foundation? SPF: So this is on the global arms business and corruption. It’s been going for a few years at a sort of slow burn level led by World Peace Foundation and a group of international researchers and campaigners that I was a part of. Among our collaborators is Andrew Feinstein of Corruption Watch UK—he is a former South African MP and anti-corruption campaigner now, who has a fantastic book out now, The Shadow World: Inside the Global Arms Trade, and a film based on it, “The Shadow World”, which is – well, I don’t know if it is in theatrers near you, right now, but it’s on in New York and it’s hopefully going to go around the country and the world. The project has been looking at the way that not just the way that the arms trade and business involves systematic corruption–because of its secrecy, the huge sums involved, it’s connections to national security, which gives it a large degree of impunity from a political level — but also the way that this corrupts national decision-making processes, undermines democracy, the military-industrial complex that Eisenhower spoke of. Now we are going to be putting more resources into it with me working full time on this project. We’re going to be building up a sort of dossier, a database of corrupt arms deals or arms deals for which there are allegations of corruption. We are continuing to explore as we have been in the project over the last couple years the myths that sustain the global arms trade industry. These are myths about national security and spending being for national security, militarist unquestioned assumptions that sustain and facilitate the arms trade and enable corruption. In addition to developing the research angle, the project has a campaigning angle, trying to build up a network of activists in different countries who are working on this issue in their own countries to provide them with resources, maybe capacity building to enable and support their work in combatting militarism, corruption, and so forth in their own countries. BC: Thank you very much, Sam. Dear Bridget Conley, really I enjoined this interview with Sam Perlo-Freeman.